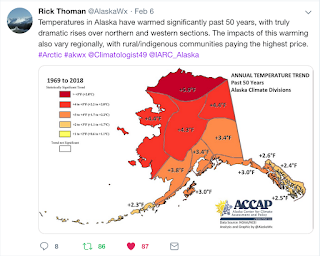 According to University of Fairbanks climate scientist Rick Thoman, in February 2019 the average temperature in Alaska's most northern reaches rose 2.8 degrees Celsius over the 50 year norm, more than three times higher than the national average. As an oil state, it's not surprising that industry is responsible for the lions share of the state's greenhouse gas (GHG) emissions. Alaska's Department of Environmental Conservation reported last year that industry emits a whopping 53% of the state's total GHG emissions, although recent evidence suggests the numbers could be as much as 60% higher. 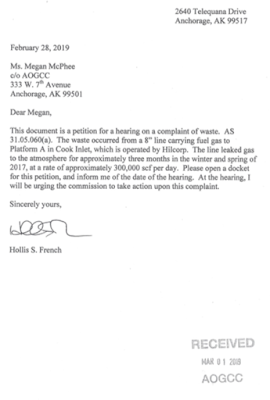 On Dec 18, 2018 citizens urged the Alaska Oil and Gas Conservation Commission (AOGCC) to step up enforcement of waste rules to reduce industry's carbon and methane greenhouse gas emissions. Kate Troll, Lois Epstein with the Anchorage Wilderness Society (TWS) and Ceal Smith, with the Alaska Climate Action Network (AK CAN) delivered petitions, collectively signed by more than 400 Alaskans, and gave public testimony outlining the reasons why this action was important. 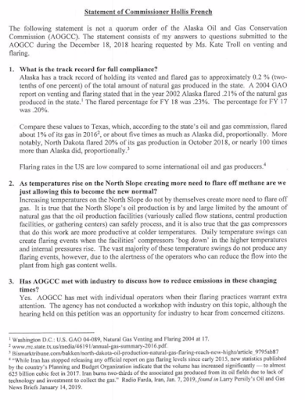 Ceal Smith with AK CAN presented data obtained from AOGCC that showed more than 1,400 gas flare and venting events in excess of one hour occurred between Jan 1, 2012 and Feb 1, 2017; nearly one event every day for the past five years. According to agency rules, any release in excess of one hour is unauthorized waste that must be justified or a fine levied if found to be without cause or due to negligence. 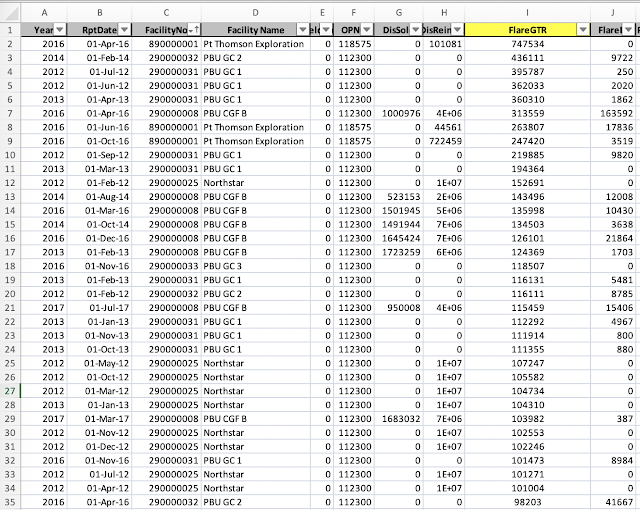 Thirty-four of the venting/flaring incidences released more than 100,000 thousand cubic feet (Mcf)*of greenhouse gas, as shown in Table 1 below. 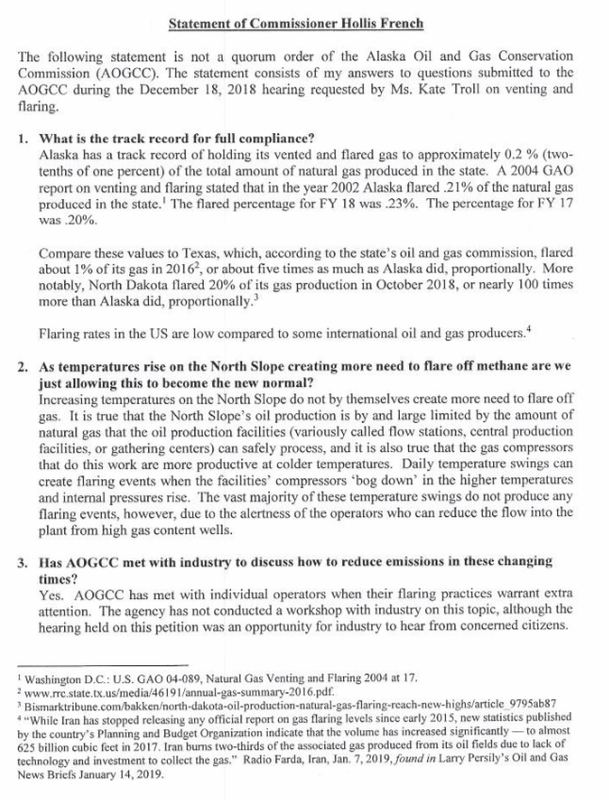 TABLE 1: Gas flaring or venting events greater than 100,000 Mcf that occurred between Jan 1, 2012 and Feb 1, 2017, as reported by industry to the AOGCC. In subsequent follow-up, the Commissioners were unable to provide evidence of a single enforcement action relating to the 1,400 flare/venting events. They offered information on four unrelated violations instead, two more than 10 years old. Given the alarming lack of oversight revealed in our filing, the official agency response from Commissioners Foerster and Seamount, Jr., (posted below) is disturbing. They misrepresented the facts in several important ways. First, the Commissioner's assertion that "all witnesses were open about their root concern, the reason the hearing was requested, which is climate change" is incorrect. 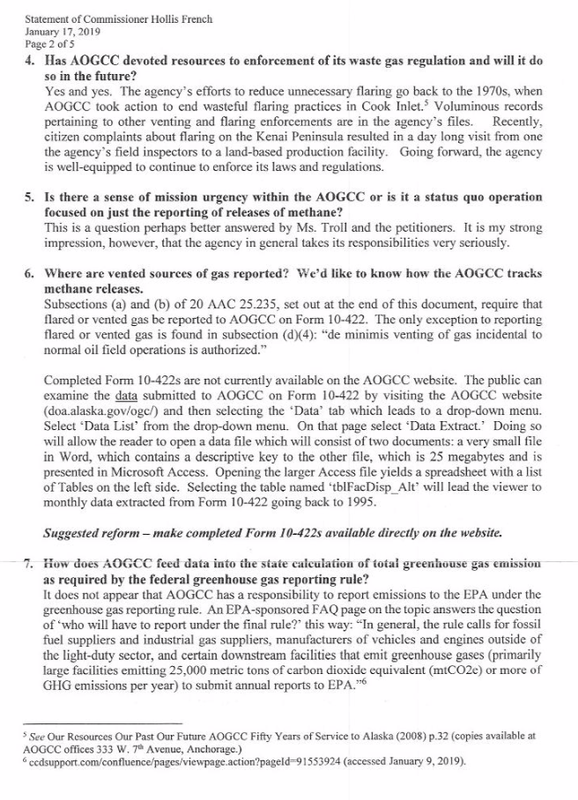 Troll, Epstein and Smith all stated clearly that, while escalating climate change was driving citizen concerns, the petitions and subsequent testimony was about enforcing existing waste statutes (as point #3 in their response letter posted below confirms). The Commissioners "findings" are of even greater concern. The assertion that "no specific example or claim of waste was raised during the hearing" defies the evidence. 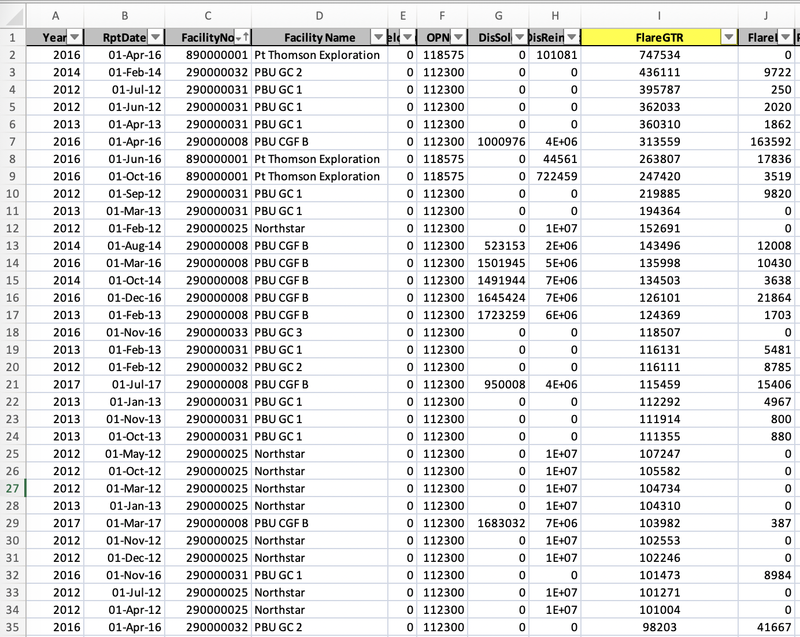 In testimony, Kate Troll asked about compliance and (as noted above) Ceal Smith reiterated the question in relation to the >1,400 releases greater than 1 hour drawing specific attention to the 34 releases in excess of 100,000 Mcf (shown in Table 1 above) in her testimony. 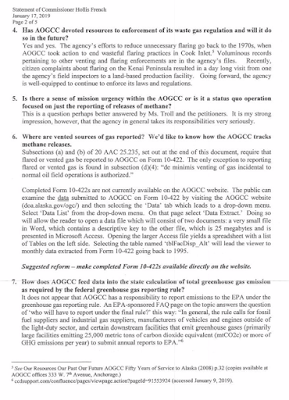 The Commissioners response, and their assertion that "both testimony and the questions raised...appear to stem from a general lack of familiarity with how the AOGCC addresses issues related to venting and flaring" appears to be an attempt to side-step public concerns. We received a separate response from Commissioner and Chair, Hollis French. French's response (posted below) addressed our concerns, and the specifics of our testimony, more thoroughly. 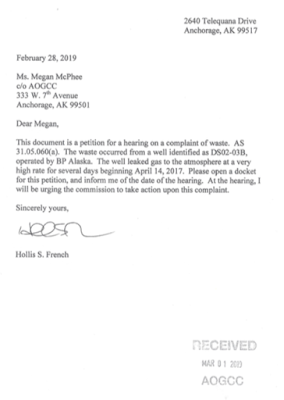 Shortly after we received the AOGCC's response, on Feb 28th, Governor Dunleavy fired Commissioner French (also reported by ADN). 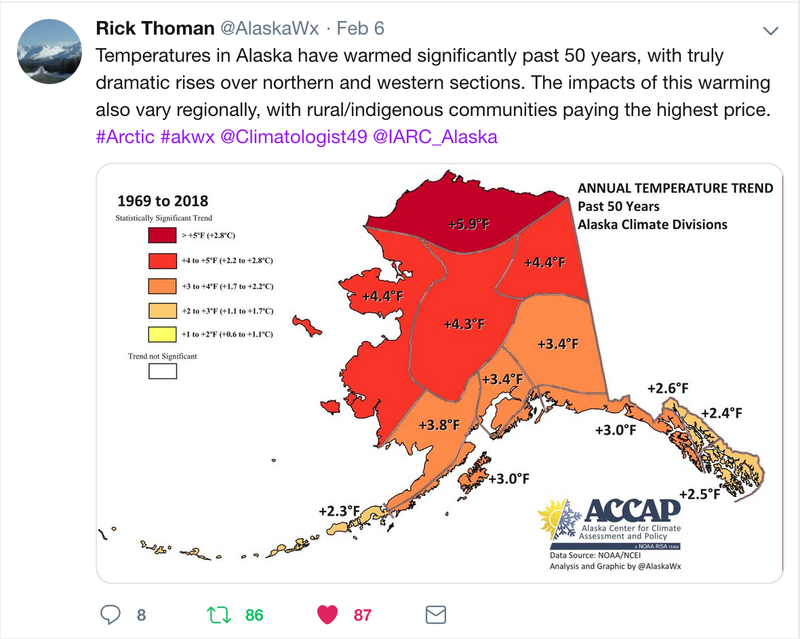 In a dangerous irony, there are signs that emissions from Alaska's North Slope oil and gas industrial zone could be on the rise due to thawing permafrost, itself a result of climate change induced by the burning of fossil fuels. A 2014 study, Landscape and Permafrost Changes in the Prudhoe Bay Oil Field, from the Geobotany Center at University of Fairbanks, documented numerous changes in the permafrost and surrounding landscape and warned that it could have significant implications for infrastructure, including oil and gas well integrity. In April 2017 a BP well failed and leaked oil and gas for days before it could be controlled. According to the AOGCC emergency order, the root cause of the incident was a combination of the well construction geometry – the outer casing shoe set in the permafrost – and thawing permafrost and subsidence. As reported by Inside Climate News, a second well failed for similar reasons in Dec 2018. 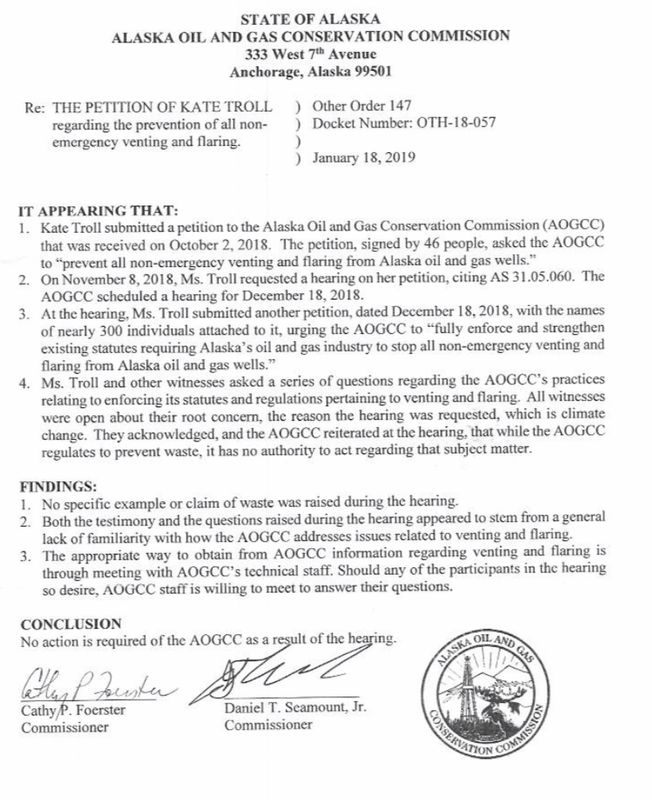 The AOGCC called for another inquiry and scheduled an emergency hearing in February 2019. Following the February 13the hearing the Commission concluded that BP’s assessment of the April 2017 well failure was inadequate, and that the oil company BP, “has no evidence that permafrost subsidence will not result in sudden catastrophic failure” at wells with two-casing-string designs, referring to a common design among the 1,700 wells at Prudhoe Bay" (read the full order here). The order concluded that BP’s assessment of the April 2017 well failure was inadequate, and that the oil company BP, “has no evidence that permafrost subsidence will not result in sudden catastrophic failure” at wells with two-casing-string designs, referring to a common design among the 1,700 wells at Prudhoe Bay" and ordered PB to provide more information. 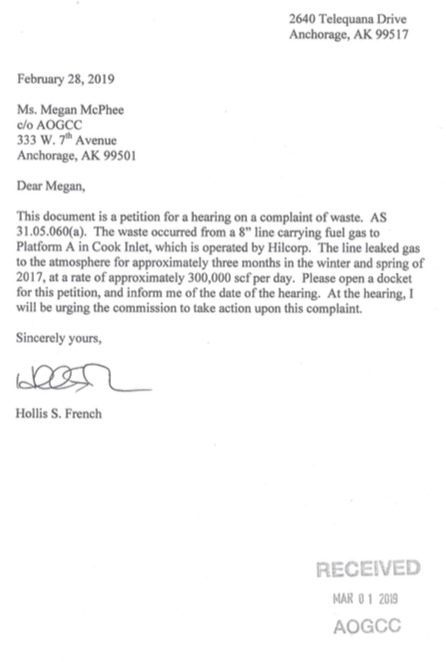 On his way out the door on Friday, Feb 28th, Hollis French filed the following two requests for a hearing. In December 2016, a natural gas pipeline running beneath Turnagain Arm in Cook Inlet, near Nikiski, Alaska, southwest of Anchorage ruptured, leaking large quantities of natural gas into the water. The escaped gas rises, and is released into Earths atmosphere after clearing the surface. It is estimated that between 6 - 8.8 million litres (210,000 - 310,000 cubic feet) of natural gas is being released from the damaged pipe per day. The pipeline operator, Hilcorp Energy, has said that there is presently too much sea ice to safely launch a repair mission. They added that shutting off the flow of natural gas through the pipeline would compound the problem, because the pipe had previously been used to transport crude oil and the residual crude in the pipe would then be exposed to the sea water once the pipeline was depressurized. 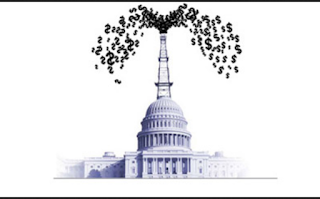 The second hearing request was for the BP well that spewed methane for several days before workers were able to get the well under control in April 2017. This was the first of two recently failed wells, referenced above, associated with subsidence caused by permafrost thaw. Research on these issues is on-going, check back for updates. Oil and gas commission expands investigation into why 2 wells failed at Prudhoe Bay. Pipeline and Hazardous Materials Safety Administration (PHMAS) reports. * 100K Mcf of gas = 5,509 metric tons of C02 or roughly the equivalent of adding 13.5 million cars/yr. to our highways.